For the third time, the 9th Circuit Court of Appeals today upheld the suppression of records in the Balco lab case. A full 11-judge panel of the appeals court agreed to reconsider its August 2009 three-judge decision that the government violated the rights of players not covered by the search warrant and must return the confiscated drug-testing records to the Major League Baseball Players Assn. The appellate judges also upheld the lower-court rulings that all subpoenas issued as a result of the excessive seizure had to be quashed. 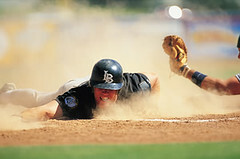 The illegally obtained evidence included results indicating that 104 Major League Baseball players had tested positive for steroid use during a 2003 confidential screening. Baseball's Miguel Tejada pleaded guilty to a federal misdemeanor of lying to Congress today. He faces up to a year in jail when sentenced on March 26. Appearing before a federal magistrate, the 34-year-old starter for the Houston Astros admitted that he lied to congressional investigators who had asked about steroid use by major league ballplayers. Tejada also acknowledged purchasing the drugs while playing with the Oakland Athletics. He said he had second thoughts and threw the drug away without using it. Prosecutors said they had no evidence to contradict his claim. Yankees star Alex Rodriguez admitted to ESPN today he used steroids from 2001 to 2003 while playing for the Texas Rangers. I think Congress has better things to do, but it is not often I get to link to ESPN. The hearings are being streamed there. This is an Open Thread. Update (TL): See Grits for Breakfast, Sentencing Law and Policy and Slate on how the Justice Department "misplayed the steroids investigation." The investigation into misuse of steroids is expanding past athletes and onto other entertainers and the physicians who prescribe them, not just for athletic prowess but for anti-aging. 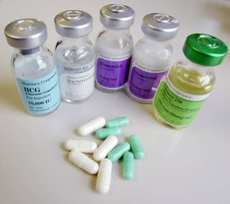 Entertainers including the singer Mary J. Blige and the rapper 50 Cent are among thousands of people whose names are turning up in an investigation into obtaining steroids or human growth hormones, an Albany newspaper reported on Sunday. The Times Union reported that the investigation, being conducted by the Albany County district attorney, P. David Soares, also found evidence that in addition to Ms. Blige and 50 Cent, other possible recipients included two other musicians, Wyclef Jean and Timbaland, and Tyler Perry, an author, actor and producer in theater, film and television. It's the cover-up that always gets them. Baseball giant Barry Bonds was indicted yesterday on four counts of perjury and one count of obstruction of justice. In the indictment, federal prosecutors said Bonds lied when he denied (to the grand jury)using a long list of banned drugs, including steroids, testosterone, human growth hormone and "the clear," the undetectable designer steroid marketed by BALCO. ....Bonds also lied when he testified that his longtime personal trainer, Greg Anderson, had never injected him with drugs, the government contended. The trainer, who was imprisoned for contempt of court after he refused to testify against Bonds, was freed Thursday night, hours after Bonds' indictment was unsealed. Interestingly, Anderson never flipped. He did three months on his own steroid-related case and a year on the contempt charge for refusing to give up Bonds. Because the grand jury concluded and there was no longer any need for him to testify, the Judge let him out. Big news from the DEA today: A major national steroid lab bust. Results: 143 search warrants, 11.4 million steroid pills seized, 29 people arrested. The countries that assisted in the 18 month undercover operation: China, Mexico, Canada, Australia, Belgium, Denmark, Germany, Sweden and Thailand . Federal agencies: FBI, Internal Revenue Service, U.S. Immmgration and Customs Enforcement and the National Drug Intelligence Center. News conferences will be held in San Diego, New York City, Houston, Kansas City and Providence, R.I., which I take it to mean those are the districts where Indictments were brought.